I am struggling y’all. I am not perfect in my God life or weight loss journey. There are situations that just throw me for a loop. So here I am writing about it, in hopes that it will help me and someone else. I am dealing with all that stress that comes with starting a new school year. My daughter is taking evening classes and that means lots of babysitting my two year old granddaughter. And it’s almost time of the month. TMI but I am just trying to be real. This morning, instead of a healthy breakfast, I ate leftover wings and a small bag of chips. First of all, those chips should not even be in the house. I bought them because they were the new flavored Lays and I wanted to try them out. I bought them agains my better judgement. I could be the poster child for Lays because I cannot eat just one! After my “breakfast of champions”, I shut all my electronic devices off and purposefully dig into today’s devotion. I was craving God’s peace. As Christians, we hear the word Grace thrown around all the time. But as I read this scripture, I began to think about whether I have a true understanding of the word Grace. When I looked up the word grace Merriam-Webster says that it is-the free unmerited favor of God. 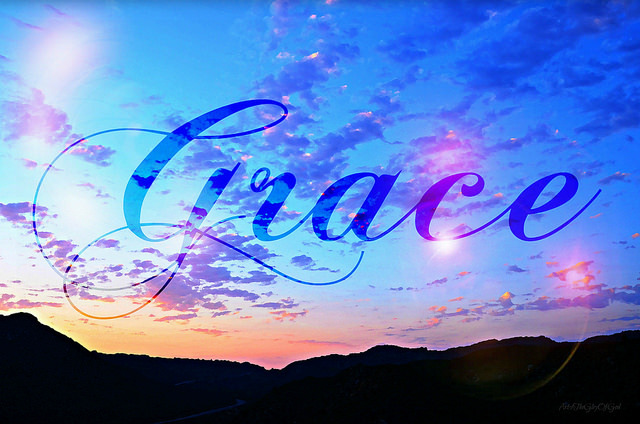 Through God’s Grace, I can be free from sin and instead, have his overgenerous, preferential treatment. That is so powerful! Now, I need to live in that. I am not going to condemn myself for eating junk this morning. Believe me, I want to. I have. But God’s Grace covers all-even my imperfect eating. It is up to me to stand on His Word and believe that “I can live a healthy life through Christ who strengthens me.” (Philippians 4:13) Food does not have to be my master during stressful times. I have to turn to God and allow him to cover me with his overgenerous, preferential treatment. This is definitely going on a sticky note on my bathroom mirror so that I can get this in my heart. Thank you God for your Grace. Help me to forgive myself for my past mistakes and current food imperfections. Remind me that condemnation doesn’t have a place in my life. I thank you that your Grace covers all. In Jesus name. Amen. I am thankful for this devotional on weight loss from Kimberly Taylor. Join me.